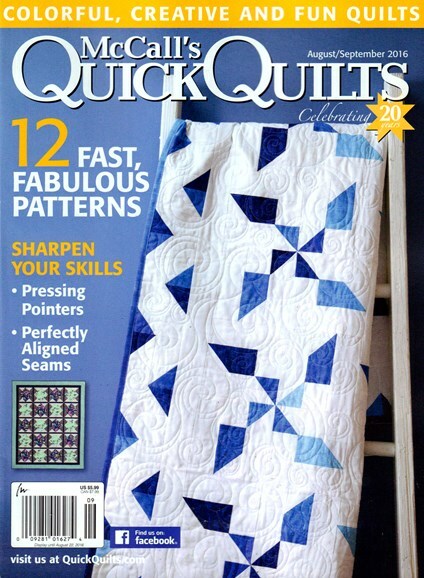 What quilter doesn't love a pattern that looks harder than it is? What attracted you to the New Wave fabrics? Why do they work well for this quilt? I have always been a fan of Caryl's work - the fabrics that she designs just have so much texture and movement in them. 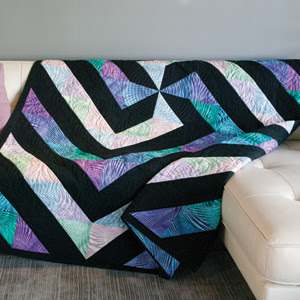 The New Wave line works well for this quilt because of that texture and movement, as well as the way her colors all blend so nicely, and the perfect amount of lights and darks. Why did you choose to pair them with black? I actually tried several different background colors (white, gray and light blue) before deciding on the black - it just really makes the colors pop and sparkle. Can you talk about the palette you did choose? I am a sucker for the cool tones - show me blue, purple and turquoise fabrics and I fall in love! Using the different values gave the quilt more depth and helped to emphasize the spinning movement in the quilt. I really enjoy designing quilts that look difficult, but are actually very simple to make. This quilt is all half square triangle blocks - so while it takes a while to make all 120 of them - it is actually pretty easy! The fun part for me was the layout - having the starting point of the pinwheels off center give the quilt even more movement and interest. Where did the name, Cartwheels, come from? The spinning illusion in the quilt makes me think of little girls turning cartwheels on blacktop. Talk about the machine quilting. Mom (Linda) used a modern spiky feather on the black, and a combination of curves and spikes in the colors - it really added to the movement in this quilt. What do you envision this being used for? It is a slightly wide twin sized quilt (72" x 86") - I can see it in a teenage girl's bedroom or as a college dorm quilt! The quilt is now in our guest room - it goes really well with the Tiffany blue walls and black wrought iron furniture. Click here to see Caryl's New Wave collection. Click here to learn more about Stephanie and Linda's work. I really like this quilt and the fabric line that was used. It is so refreshing. I also find the black makes things pop in a different way than any other background does. These are nice. I could find room in my sewing room for all of these. Beautiful! Love the way the black works with the colors!